Editor’s Note: For the final instalment of our 2016 Australian watch round up we’re looking at the fun and fashionable Carlton, from the Melbourne Watch Company. We’ve got a soft spot for the Melbourne Watch Company, and that’s not just because it’s named after our hometown. The serial Kickstarters have done well in separating themselves from the ever-growing pack of affordable, online watch brands. Last year we checked out the flagship Portsea, and today we’re spending some quality time with the Carlton. Its fifth and largest watch, and far more fashion-focused than the other models, this is another success story for the brand. Consistent with the rest of MWC’s catalogue, the Carlton is clean, restrained and honest, featuring two chronograph sub-dials (minutes and hours respectively), with pump-style pushers. Coming in at a larger-than-usual 42mm, the case is plated with rose gold, in a square cushion shape – a nod to the automotive-inspired designs of the 1960s, notably the Heuer Camaro. A silver dial with rose gold markers and hands match the case nicely, paired with a brown leather strap, so there’s no faulting this classic colour combination. Engraved on the caseback is Melbourne’s iconic Royal Exhibition Building, which is located in Carlton, the suburb that lends the watch its name. (Fun fact: it’s the first building in Australia to be awarded UNESCO World Heritage status.) Powering the watch is the Seiko VK64 movement, making this the first time MWC has used a quartz movement, which is what keeps the Carlton at the friendly sub-$500 price point. But even here the movement is quite interesting. It’s meca-quartz, which basically means it takes the best bits of both worlds. The timekeeping elements are essentially quartz, while the chronograph components are mechanical, giving you that rich analogue feel and smooth sweep of the chronograph seconds hand – and instantaneous snap-back when you reset. It’s an uncommon choice, and one that really makes MWC stand-out. 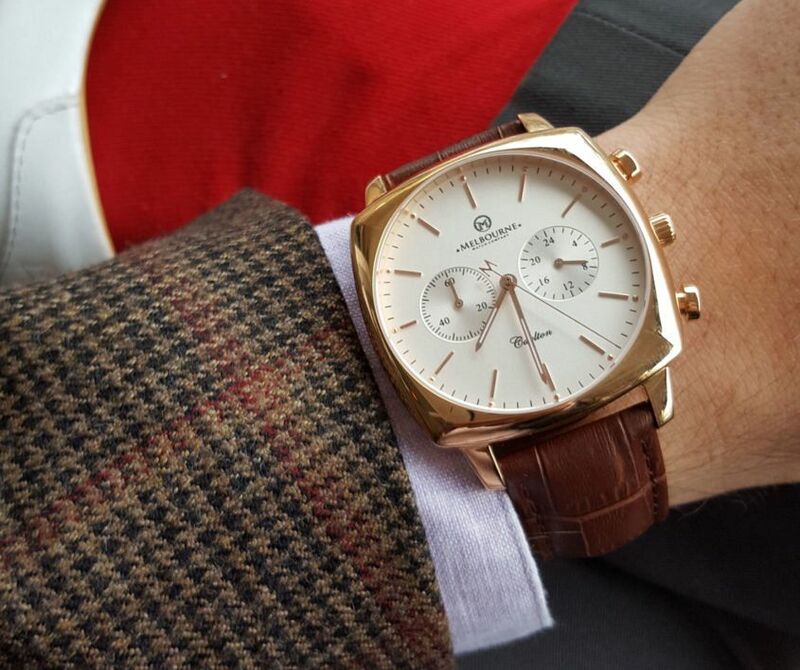 On the wrist, the Carlton is legible and comfortable, though thanks to the square shape it wears fairly large. 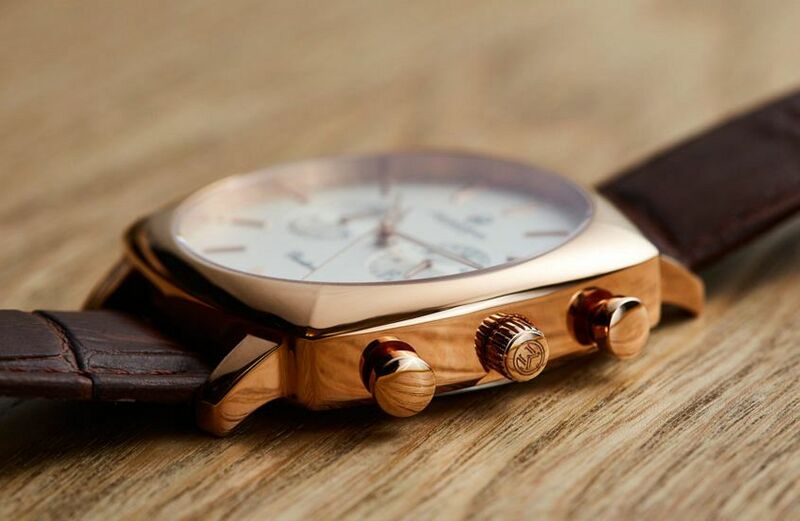 For this dressy rose gold version, I wouldn’t mind seeing a few millimetres shaved off, but I suspect this would be less of an issue with the steel and black dialled version. 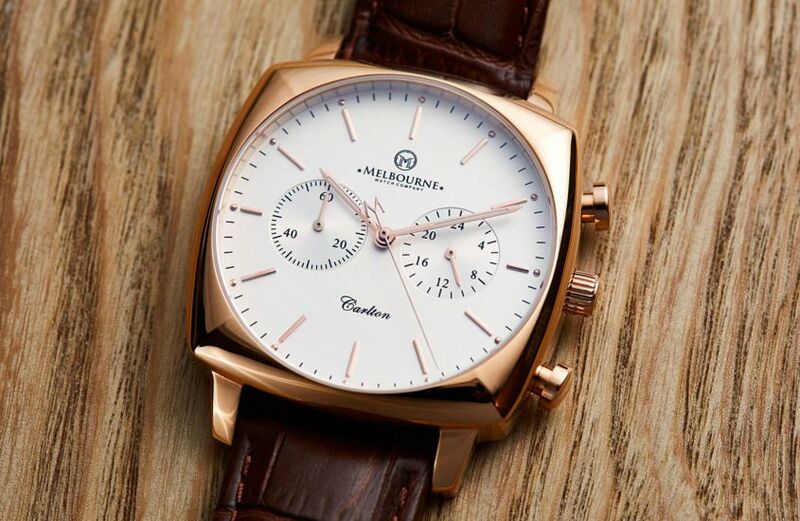 All told, the Carlton is another solid, good-value offering from Melbourne Watch Company. The Melbourne Watch Company Carlton, $495, available from their site.